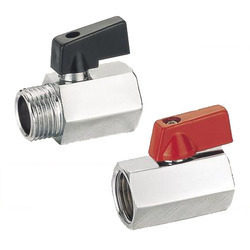 Our range of Mini Ball Valves is manufactured using the finest quality raw material. These valves are known for their durability, constant performance and sturdiness. These mini ball valves are very helpful and work very smoothly. These wide ranges for mini ball valves are appreciated for its superior performance, Zero Leakage & Corrosion Free. They are accessed at competitive prices. 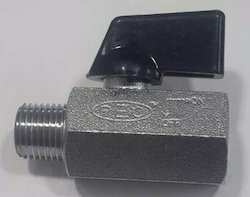 Available Sizes : 1/8", 1/4", 3/8" & 1/2"
Backed by our in-depth industry expertise, we offer a superior range of Mini Ball Valve Female X Female to our clients. We offer our range in different sizes and specifications which can be personalized as per the requirement of our clients. These are fabricated using best grade raw materials and advanced technology. Moreover, we offer our range to our clients at reasonable prices. We welcome the customer with Customized thread and any other changes in product. Backed by our in-depth industry expertise, we offer a superior range of Male X Female Mini Ball Valve to our clients at reasonable prices. These valves are precisely made as per the international quality standards. This machine is widely appreciated by our clients for its unique features like functionality and durability, free from resistant and long lasting features. They are checked on various parameters to deliver a flawless range of products. 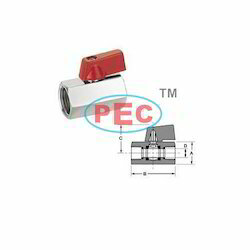 We are manufacturing good quality, leakage free and corrosion free, PEC make Mini Ball Valves in various sizes. 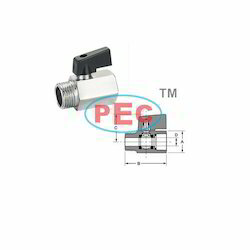 PEC Mini Ball Valve is very small but good quality of raw material, sufficient thread length & wall thickness make it failure free & very useful product. 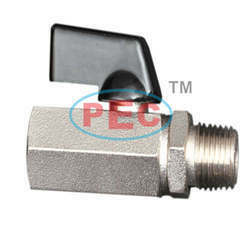 We offer Mini Ball Valves in BSPT Thread. There are two types of Valve, One is Male Thread to Female Thread & Second is Female Thread to Female Thread. We provide Thread as per IS standard. This valve is suitable for Compressed Air, Water, Oil, Fuel...etc. 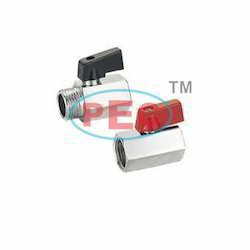 On Request We can provide Above Valve up to 220°C Temperature. We offer Mini Ball Valves in NPT Thread. There are two types of Valve, One is Male Thread to Female Thread & Second is Female Thread to Female Thread. We provide Thread as per IS standard. This valve is suitable for Compressed Air, Water, Oil, Fuel...etc. Looking for Mini Ball Valves ?